National Home-Brew Day is coming upon us fast. Yep, Saturday, May 7 is the day. Are you going to brew something? I am. Or more accurately, my wife and I are going to brew something. 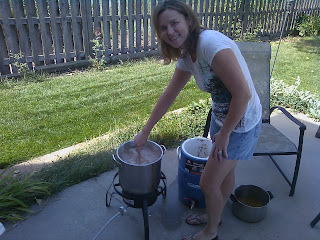 So far, my wife (aka the SheppyBrew Beer Model) has participated in one brew day. 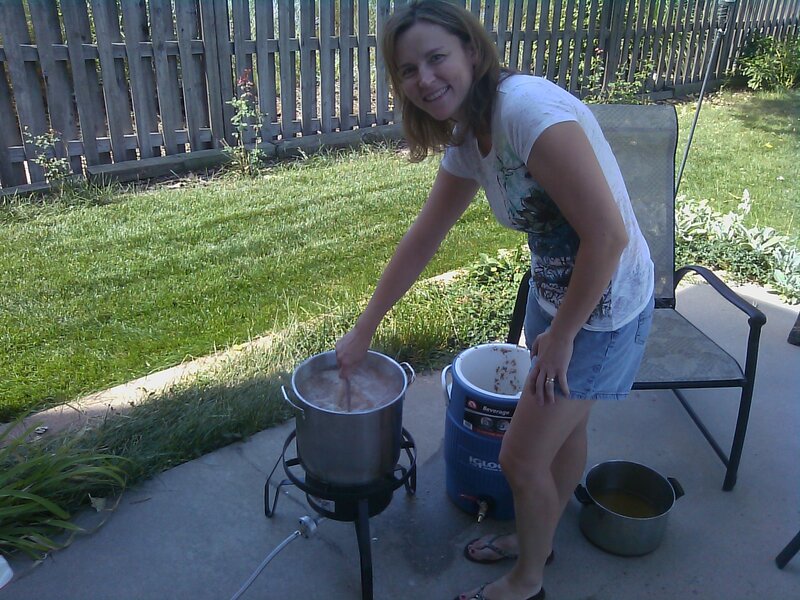 She helped me brew 15 Year Anniversary Amber Ale the first time. That beer turned out fantastic. It is one of those beers that we both like. It is hoppy enough that I am a bit surprised that she likes it, but it is one of those beers she grabs for herself just about every weekend. Its hop flavor / aroma comes from crystal hops, which is very similar to some of the noble hops. It give more of a mellow, floral flavor and aroma than the citrusy American hops, so she is just not associating the beer as hoppy. It is hoppy, just different hoppy. I call it an amber ale hopped like a German Pilsner. Anyway, the Beer Model thinks she wants to brew something. She says she wants to brew something that SheppyBrew has not brewed before. She also says she doesn't want anything dark or hoppy. Unfortunately, all of my future to-brew-list beers are hoppy or dark or both. Fortunately, this means we can come up with a new SheppyBrew recipe. But, when I ask her what she would like to brew, the most I can get her to narrow it down to is "not hoppy and not dark". I can't even get her to narrow it down to ale or lager. Cocoa Blonde: Not too long ago I was at Dry Dock Brewing Company and had a blonde ale that had added cocoa nibs into the secondary fermentation. I was very impressed and thought the Beer Model would probably enjoy it. Vienna Lager: I've wanted to do a Vienna Lager for some time. It is an Amber Ale, but I don't think it would end up darker than 15 year or Buckwheat's BPA. Sam Adam's Boston Lager Clone: I have links to several clone recipes. We both have enjoyed many Sam Adam's in the past. I think she'd like this beer. Kolsch: Practically speaking, I'm not sure a SheppyBrew Kolsch would be much different from Wetta Blonde or Girly Berry, but this is another beer style I've been thinking about trying. I would probably use the recipe from Brewing Classic Styles. Cocoa Kolsch: A Kolsch with cocoa nibs. American Wheat: Tracy loves her gateway wheat beers such as New Belgium's Sunshine Wheat. We could add honey to make it a honey wheat or/and raspberries or/and apricots or some other girly something (maybe even cocoa nibs) to add some excitement to the American Wheat. Altbier: She might think the color of an Altbier would be too dark, but she's wrong. She would love an Altbier. In fact, she did enjoy a few at GABF. California Common Beer (aka Steam Beer). I don't know. I just think she'd like it. Saison: Who doesn't like a nice farm-house ale? Belgium Blonde Ale: It's light in color and high in alcohol, what's not to like? It might have a bit too much of the Belgium funk if we are not careful, but it is worth a try. So, if anyone out there has a vote, or even more nominations, leave a comment. The Beer Model gets the final say, but I'm sure she'd appreciate any help she can get making the decision. I also brewed a batch of Gringo Cerveza Jalapeño Cream Ale today. 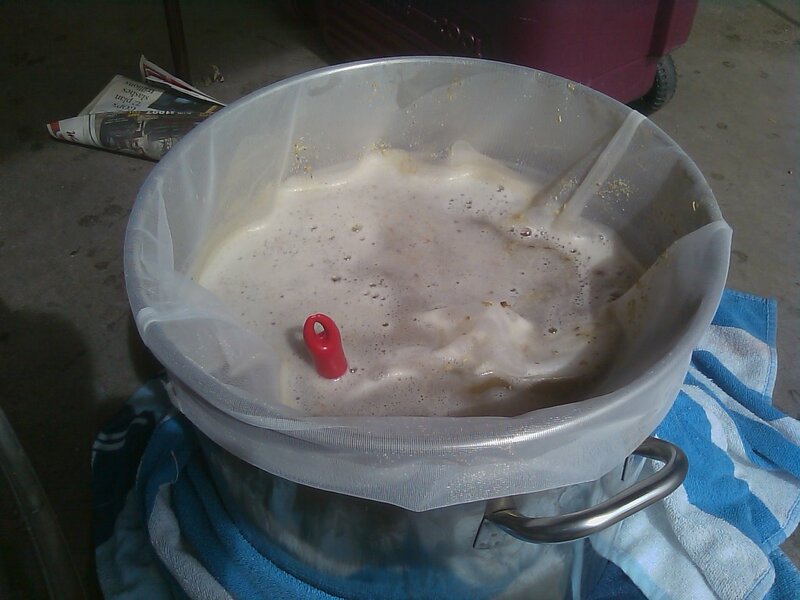 It was my first official all-grain BIAB batch, and it went great. My mashing efficiency appears to be about as good as what I was getting in the mash tun. I split this batch into 2 Mr. Beer fermenters. I was planning on just adding jalapenos to one of the fermenters in a few days, but now I am thinking about maybe either adding the peppers to both, or maybe adding something else (green chilies maybe) to the other. I would like to be able to try this beer on Cinco de Mayo, although I am cutting it sort of close by only brewing it today. I guess we'll see how it goes. My BIAB process was a little non-standard. Typically "official" BIAB brewers try to mash with the whole boil volume plus whatever volume of water the grain should absorb. Beer Smith had me hold back 2.16 gallons of sparge water rather than use the whole boil volume for the mash. I had sort of assumed that this was because my pot would not be big enough for grains plus the whole 7 gallons of water, but I certainly could have fit more water in. It might just be that Brad Smith never considered BIAB when he designed the software. Or, maybe I did not set up my brewing equipment just right. Anyway, I followed the directions and "sparged" by putting the grain bag in my 5 gallon gott cooler and pouring the sparge water on top. Again, the mash efficiency seems very similar to what I was getting on my infusion mashes, so I guess it works ok as is. The strike temperature suggested by Beer Smith seems to have given me a mash temperature that was higher than I had intended. I think that is fine with this beer because I was sort of thinking that extra body would not be a bad thing with this beer, but obviously, I need to try to adjust for future beers. This might be another reason to hold back some water, so I can adjust the temp by adding boiling or frozen water after getting the original temperature reading. But, other than the minor process note, everything went great. I am going to keep doing the BIAB. Almost certainly, my next brew day will be whatever my wife decides to brew on National Home-Brew Day. I am sort of thinking a wheat beer would be a good idea, since I won't have to worry about a stuck sparge with the BIAB process. But, whatever she wants to brew, we'll brew. My first ever all-grain BIAB.